As usual, you can click on any image to see the high-resolution version. 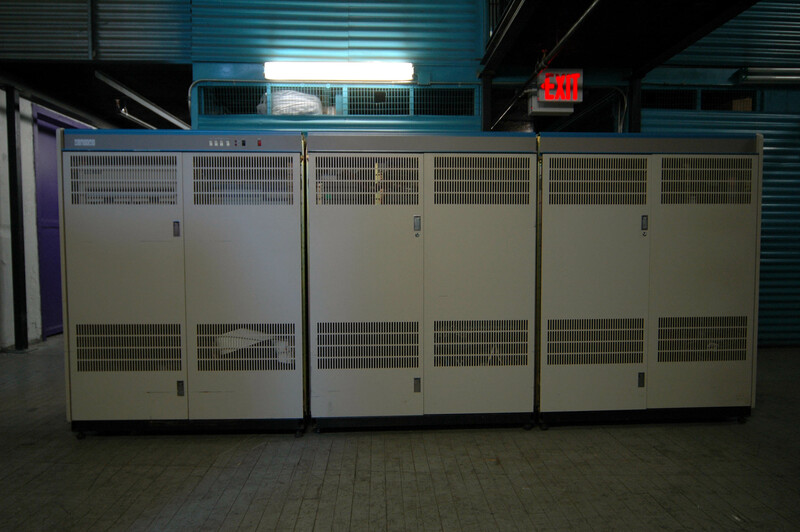 The pdp-10 was the pre-VAX large system. 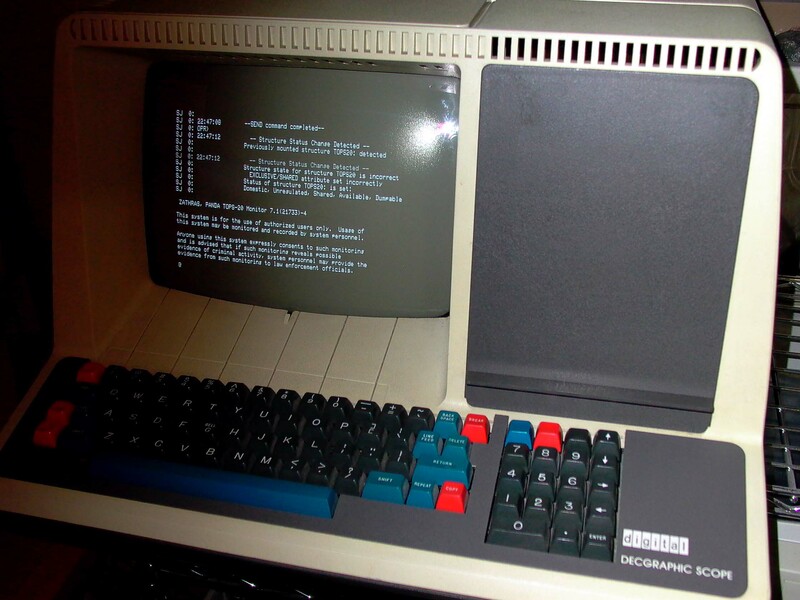 It was octal, a 36-bit machine, and went through various incarnations between 1965 and (I think) 1983, when development finally stopped. Operating systems, TOPS-10 and TOPS-20, were wonderful pieces of s/w engineering, seeing the first implementation of ideas now in common use in o/s and network architecture. If you want to experience them firsthand, visit http://www.corestore.org/tops.html - warning, it's a large download (which will take a minute or two even on broadband) and it's a Java applet which will ask for permissions; it IS kosher! 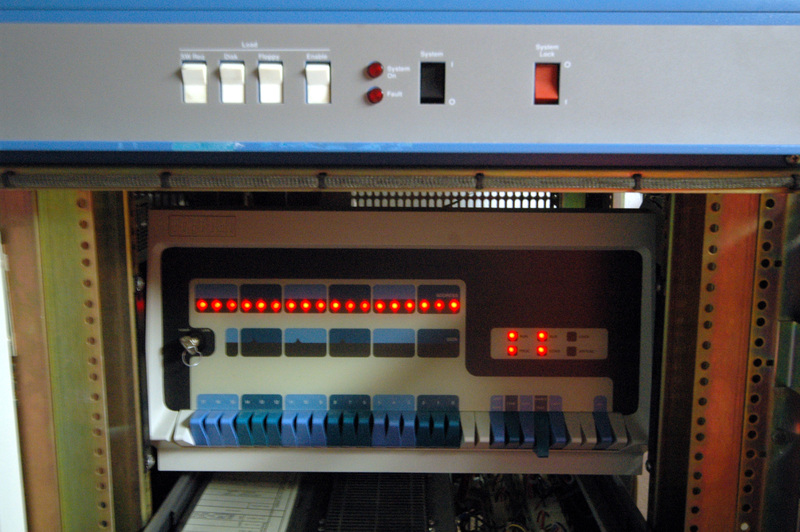 This is the third pdp-10 I've aquired. Unlike the others, I didn't get it from the original user - via a convoluted route it ended up in Canada, with Heinz Wolter. I eventually traded an IBM S/390, a pdp-8e, and a quantity of cash for the big beast. 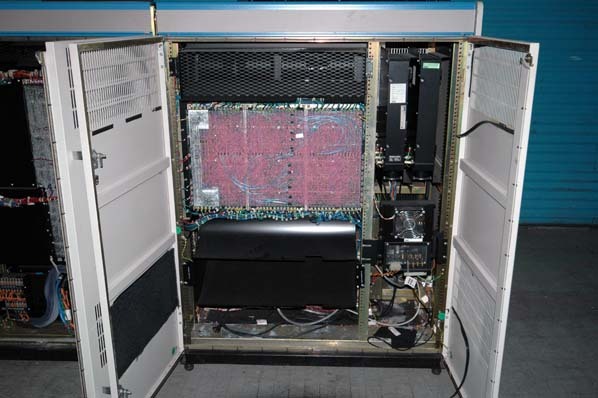 It's a 2065, pretty much the ultimate DEC -10 system - latest CPU, MCA25 cache. MG20 MOS memory, NIA20 ethernet etc. I'd dearly love to know the previous history of this machine - anyone who can throw any further light, please get in touch! UPDATE 10th November 2005: I've found the original owner, thanks to a service tag on one of the third-party power supplies. 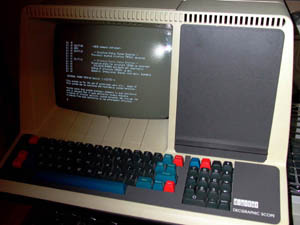 The machine was one of five originally owned by Bryker Data, an Ontario service bureau. I've discussed the system with Bryan Kerdman, who founded Bryker Data in 1976 at the age of 19 (! ), and bought his first KL in 1979. Here's the beast; three big 'corporate' racks - basically the same racks used for VAX 8600. 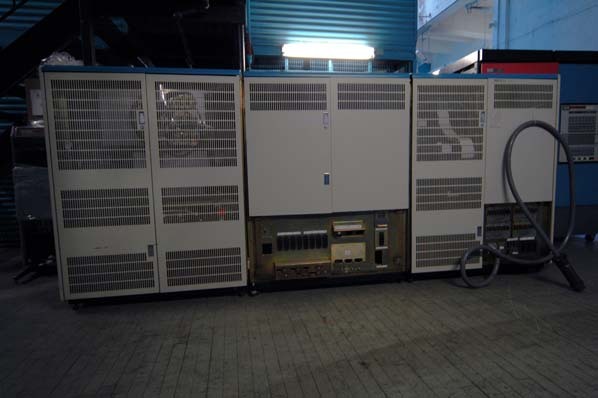 They started using these racks for the very last KLs built, to meet FCC emissions requirements. Front doors open - front-end on the left, Massbus & memory in the middle, CPU on the right. 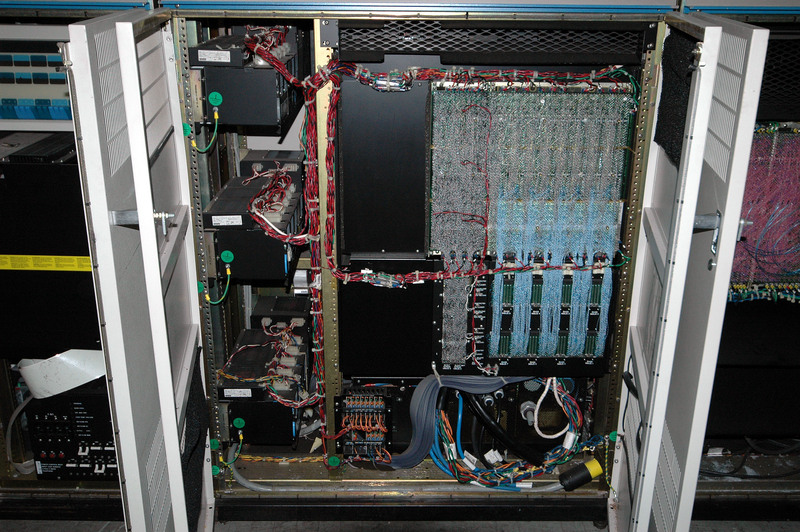 The CPU rack in closeup - the two modules to the right of the CPU are the NIA20 & DTE20. UPDATE 10th November 2005: we can't blame DEC for the lack of any identifying logo. Bryan Kerdman, former owner of this machine, has told me how, in the interests of not appearing old-fashioned to customers touring the datacentre, they had the cabinets repainted from '20 orange' to 'VAX blue', and the DECSYSTEM20 logo removed. So they looked like VAXen. Grrrrrrrr. True enough tho - if you look closely at a couple of scraped areas you can see the orange paint under the blue... scroll down to the bottom of this page and you can see a 20 in the same cabinets as mine, but with the orange paint job and DECSYSTEM20 logo. Rear view of the racks, with a bloody great power cable to be hooked-up in due course. 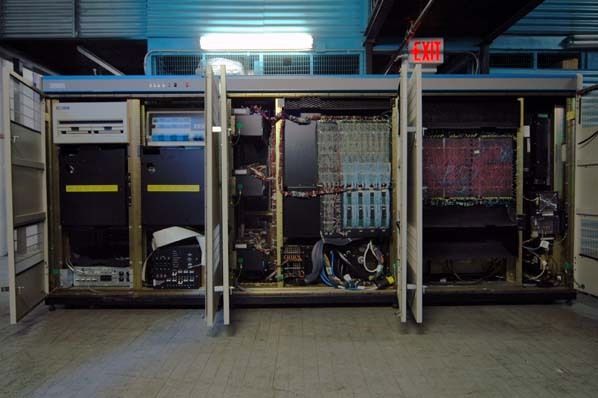 No that's *not* a System/360 in the background - close but no cigar, it's an IBM 1800. Rear doors open - on the left, the power supplies for the CPU. 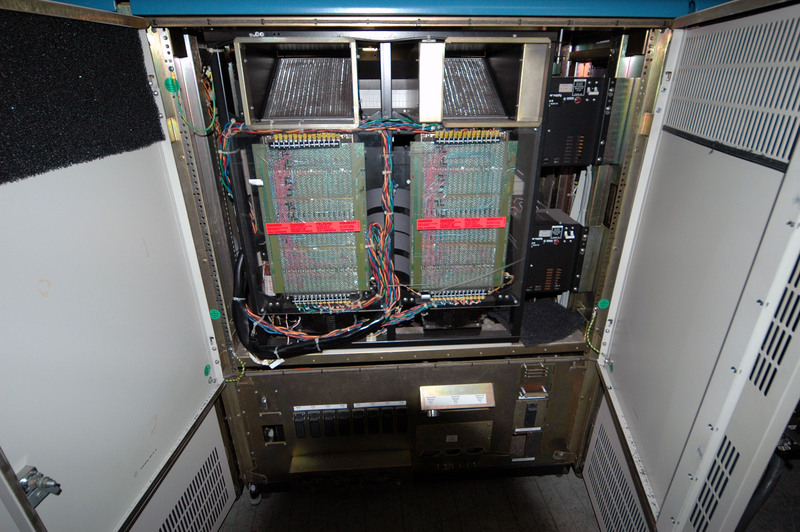 Two MG20 memory units in the middle cab now visible. UPDATE 10th November 2005: I've been puzzling out the power supplies. 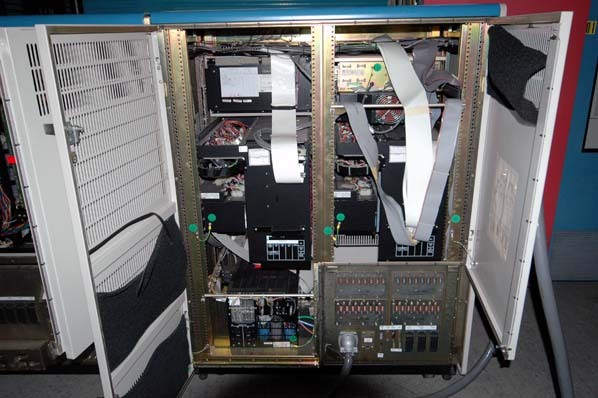 Those two small silver boxes swung out on the gate are the *total* power supply for the CPU! 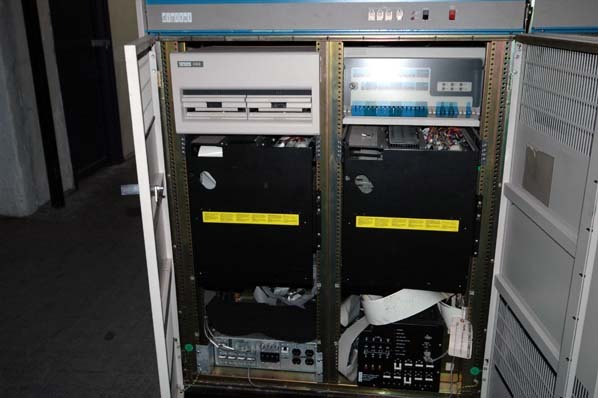 They're PowerTec SuperSwitcher units, they take 230V single-phase in, and pump out the required -2V (small silver box) and -5.2V (larger silver box) required to drive the ECL CPU logic. Yes, those two little boxes replace the huge three-phase transformer, linear regulators, and series-pass assembly of the DEC linear power supply! The two gold-coloured boxes in the bottom of the rack supply the power for the MG20 memory boxes in the adjacent rack. They also take 230V single-phase, so it should be possible to run the machine off domestic current, with a suffiiciently high-amperage circuit and some reconfiguration of the DEC power supply (the primary power controller is still 3-phase remember - wonder if I could just give power to the two phases that are used and run with that?). 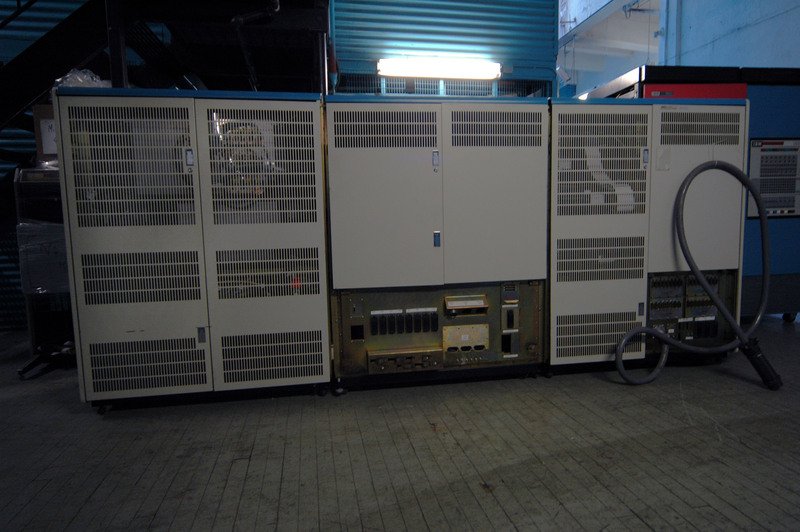 MG20 modules in middle rack. 1. 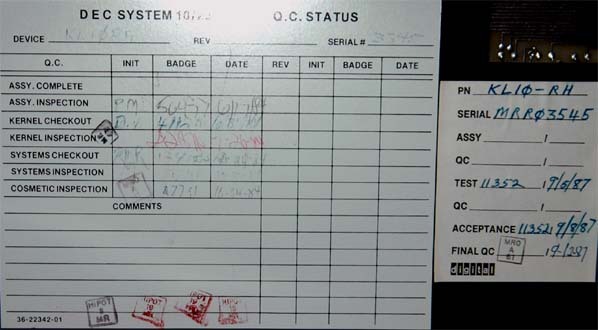 The designation is KL10-RH, which confirms it had the final MCA25 cache/pager upgrade. 2. The serial number is clearly 3545 on the QC- but appears altered on the serial number tag itself -see at the top of this page, '3526' seems to have been written in. 3. The initial QC dates are all in '84 - but the 'Final QC' sticker on the right is dated '87. Why? Perhaps it was stored for three years before delivery??? 4. Or perhaps it was delivered, sent back, and refurbished in '87? Is that the meaning of 'MRR' in the serial number - Marlboro Refurbished? 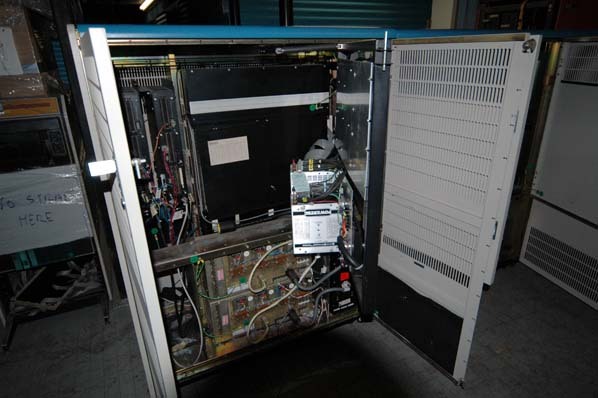 Please get in touch if you can shed any light on the history of this machine - serial 3545 or 3526! http://starfish.osfn.org/rcs/DECsystem/1090/ the RCSRI have a beautiful one! 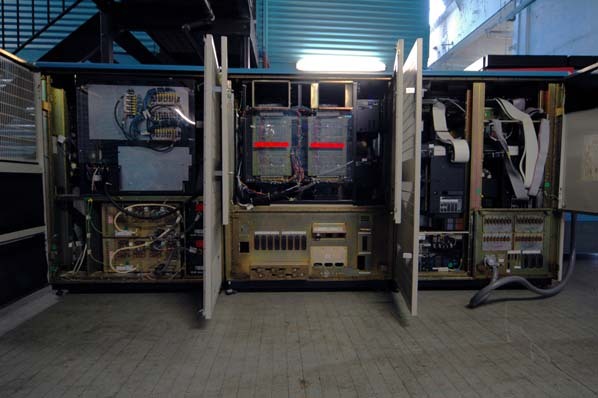 http://www.stupi.se/Bilder/pdp-10/index.html makes me (and most other computer preservationists I suspect) look like a complete amateur!